Kevin Young, Web Industries’ vice president of corporate development, shares his views on textiles and nonwovens from the perspective of a converter serving the aerospace, medical, personal/homecare and industrial markets. In 1969, with $10,000 and the support of family and friends, Bob Fulton founded Web Industries Inc. as a slitting company. At the heart of Fulton’s firm was the strong belief that a good business is built on sincere, solid relationships with clients. This belief still drives Web Industries today. In 2000, Web became an employee-owned company (an ESOP), providing the associates with an ownership interest in the company and focusing their dedication to the success of Web. After building the client base to 800 customers in a wide range of industries, the company reimagined itself and its business. 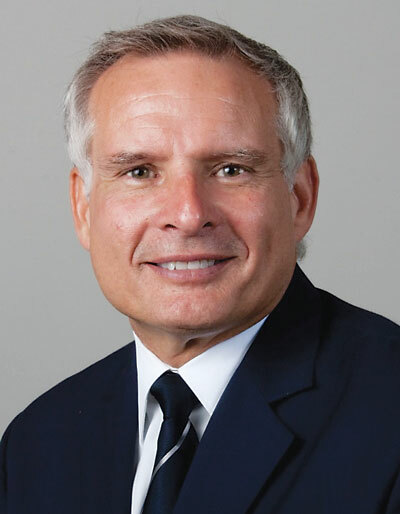 In 2008, under the leadership of then COO Mark Pihl, who today is president and CEO, Web refined its business strategy to focus on four key markets: aerospace, medical, personal/homecare and industrial. Today, the Marlborough, Mass.-based company applies its problem-solving mentality to serving a core client base of approximately 200 customers across these industries. In each market, Web has developed a longstanding reputation for precision, quality and problem solving. For the traditional textile manufacturer, the activities Web undertakes to supply products in to the manufacturing supply chain may not be common knowledge. Within the traditional textile industry, converters are known for buying fabrics from mills to sell to garment manufacturers or clients in apparel sourcing. This is not the case at Web. Textile World recently had the opportunity to speak with Web Industries’ Kevin Young, who was appointed vice president of corporate development in August 2016. He has been a member of Web’s board of directors since 2014 and retains his board seat as a management representative. Young reports directly to Pihl. TW: Thank you for your time, particularly given the significant recent acquisition. But before we get to that, please give the readers a sense of the size and scope of Web today. Kevin Young: Since our humble beginnings, we’ve expanded dramatically. Today we have nine operating plants — six in the United States and three in Europe including our recent acquisition of OMEGA Systèmes, in France. Web has more than 700 employees, with 500 in the United States and 200 in Europe. TW: How significant was refocusing on four key vertical markets to the success Web is realizing today? Young: It was probably the single most significant activity that Web has undertaken. Our employees are exceptionally clear on the type of work that we do, the customers we serve and where our research and development efforts are channeled. By focusing on our four vertical market segments, we’ve grown the business significantly while streamlining the number of customers we work with. TW: Please explain Web’s activities in the aerospace, medical, personal/homecare and industrial markets. Young: In aerospace, we are the world’s largest independent converter/formatter of composite materials. We enable our customers, the major OEMs and Tier 1 suppliers/aerostructure fabricators, to concentrate on their core competencies while we provide vendor-managed inventory services and deliver products in the exact format that they need it — when they need it. We’re not limited to supplying materials to the commercial aerospace market. We also are very active in defense and space markets, formatting materials that go into missiles, satellites, rockets, helicopters and fighter jets. In the medical market, our focus is on outsourced manufacturing, specifically for the lateral flow immunology market. We play a key role in producing over 1 billion diagnostic test strips annually for some of the largest OEMs involved in diabetes testing devices and medical lab testing kits. Additionally, we’ve developed a process for invitro diagnostics that uses a continuous web of laminated flexible materials as opposed to the industry norm of discrete manufacturing. This provides cost advantages for our customers by leveraging manufacturing efficiencies. In personal and home care — which encompasses diapers, adult incontinence and feminine hygiene products — we provide comprehensive material-converting services under one roof, from multicolor printing to precision slitting and large-format spooling. To our knowledge, we’re the only company that can do so. This approach is necessary to meet the needs of fast-moving consumer goods companies. They are always looking for new efficiencies that enable them to respond quickly to their customers’ demands and deliver their product to market faster. With respect to the industrial market, we leverage our core competencies of slitting and spooling in a number of sectors. Within the wire and cable market, for example, we have developed unique shielding products that cut down on alien crosstalk and dissipate heat as information flows through today’s high-speed cables. We also provide multi-layer insulation to customers involved in making satellites, MRI machines, liquefied natural gas tanks and other products. It insulates their components from severe elements, such as freezing conditions or extreme heat. For example, on a satellite, the insulation keeps the inside of the satellite warm in space, but also protects it from heat when it passes through the atmosphere. TW: It is fairly apparent that Web’s market selections are no accident. Please discuss the growth and trajectories of these markets. Young: Fortunately for us, we’ve picked well, but that doesn’t mean the markets all grow at the same rate or at the same time. In general, we work in markets that have demonstrated strong growth over recent years. We see positive growth in all of our market segments because of some megatrends that are happening in the world today. For example, one of the factors driving growth in aerospace is the demand for low-cost travel worldwide. The number of new, more efficient passenger planes coming online is significant, and the light-weighting of this latest generation of aircraft plays exceptionally well into our composite formatting strategy. Within the personal and home care division, our customers are responding to consumers’ busy, on-the-go lifestyles and finding innovative ways to help consumers simplify and make life easier. Products such as disposable diapers help people do this. The aging population also contributes to growth in adult incontinence products. When it comes to the wire and cable business, as we like to say: In the wireless world, there’s more wire being used in data centers than ever before. As global wireless coverage continues to be built out at a rapid pace, our products help enable the transmission of that data. Each industrial market has its own drivers. We benefit from being able to leverage our technologies from our core markets into our industrial market segments. In the medical market, we see a real opportunity as a contract manufacturing organization (CMO). We hear daily on the news that healthcare costs are skyrocketing, and there is a clear demand to reduce those costs. Web offers medical and life science companies a level of precision, quality and scale that no other non-competing CMO can offer. By specializing in high-tech commercialization and manufacturing solutions for lateral flow immunoassay (LFI) devices and medical diagnostics, we offer cost-effective solutions for our customers and their end users. By the time a medical product has been designed, about 10 percent of the total product budget has been spent. At that point, the design has already determined 80 percent of the product’s final cost. Those economics make it crucial to partner with the right CMO early in the process to control costs downstream and deliver a cost-effective, but cost-conscious product. TW: Please provide some insight into the processes used by Web. What refinement, investment and even invention over the years have set Web apart? Young: Web’s focus has always been on the precision formatting of flexible materials. 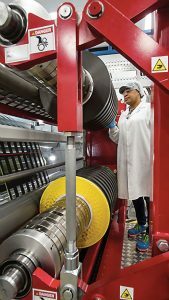 Our customers need specific flexible materials to be formatted to suit their production process, and we have numerous converting capabilities to do that. If we don’t have the right capability already, we will use our ingenuity to create a solution to meet our customer’s needs. Ingenuity is one of our greatest differentiating qualities, and when we develop a new machine or process, we protect that intellectual property fiercely. Web Industries offers customized formatting services, such as for thermoplastic slit tape pads, that are customized for the end user’s manufacturing processes. TW: You must attract many talented employees. How do Web employees impact your strategy going forward? Young: One of the principal reasons that our founder, the late Bob Fulton, sold the company to the employees was that he realized they were the reason for his success. We still believe that today. We’re an employee-owned company, and our success is a function of the quality of the people we attract. To provide the ingenuity and solutions our customers expect, we have focused greatly on expanding our engineering and technical talent. More than 15 percent of our workforce has a technical background, allowing us to provide exceptional service to our customers and solve the complex problems that they bring to us. TW: Can you speak about recent investments and how they fit into the future of Web industries? Young: We continue to look at our four vertical market segments for growth and to invest in each of them. Our most recent acquisition of OMEGA Systèmes in France is a great example of our commitment to aerospace. Our customers asked if we could provide the same level of independent capabilities and quality in Europe that we provide to our North American customers. We realized we needed a physical presence in Europe, and now OMEGA Systèmes allows us to provide consistent products on a global basis. At the same time, we have gained some new capabilities that we will be able to bring back to the North American market. In recent years we also have made significant investments in our personal and home care division to meet the needs of fast-moving consumer goods companies. For example, we expanded our Fort Wayne, Ind., operation by 50,000 square feet in the past year, including the addition of two eight-color flexographic presses and what we believe to be the most advanced large-format spooler in the industry. And in our medical division, we created a new center of excellence for medical contract manufacturing to develop and implement high-tech commercialization and manufacturing solutions for LFI devices and other medical diagnostics. TW: In pursuing new business, building strong client relationships and meeting demanding product performance, what do you see as key to Web’s success? Young: Our customers bring us their most difficult problems. We may not always have the answers, but we love a challenge. We’ll sit down with those customers and help them think through the problems, the constraints and possible solutions. Very often, and we know this from the surveys we’ve conducted, they tell us that we come up with ingenious answers. That’s the key to our success. Editor’s note: Alien crosstalk is a problem that can occur when there are multiple wires bundled within a single cable. Without shielding tapes on the wire, information flowing from one wire could jump across to another, causing noise or interference in the data communication.